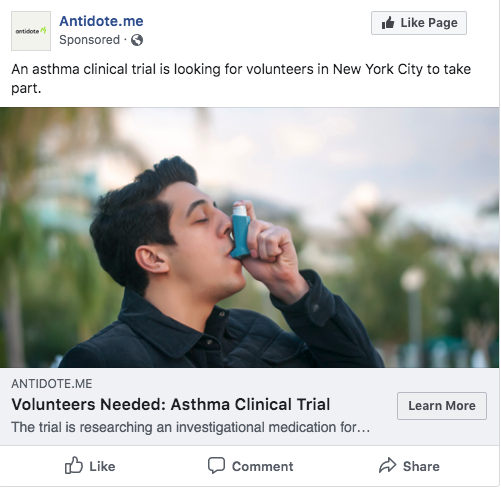 When creating clinical trial advertising materials, it's important to craft outreach copy that connects with patients. But in order for your Institutional Review Board (IRB) to approve your materials, your materials also need to adhere to guidelines set out by the Food and Drug Administration (FDA). Working within those guidelines doesn't mean your outreach has to be dry and unengaging, but it should be clear and honest. Follow these tips to ensure your materials are complying with typical IRB guidelines to give you the best shot at approval, while connecting with patients, too. The FDA considers advertising clinical trials to patients to be part of the informed consent process. Any patient-facing materials must be submitted to the IRB for your trial, but materials created for other purposes may not need to be submitted. Before you submit your materials, check the list below, as well as past IRB submissions, to confirm what does and does not need to be included in your submission packet. In general, outreach materials should not be considered overly coercive. Of course, that can be a relatively subjective judgement, and every IRB is different. That being said, there are general guidelines put out by the FDA that help clarify the kind of language that may be considered coercive or otherwise inappropriate by your IRB. These guidelines are in place to help protect patients and avoid confusion around what it means to participate in a clinical trial. No claims should be made that the investigational treatment is safe or effective, or that it is equivalent or superior to existing treatments. This includes both explicit and implicit claims. The IRB will review content, as well as the font size and type, and other visual effects, in determining whether materials are too promissory. Outreach materials should not use language such as "new treatment," "new medication," or "new drug" without explaining that the treatment is investigational. In other words, "new investigational medication" may be approved, but "new medication" would not be approved. Such phrases may lead patients to believe that they will be receiving a treatment that has already been approved by the FDA, or has already been proven effective. Outreach materials should not promote "free medical treatment" to refer to study-related care patients will receive. If the trial is paid, payment may be mentioned, but not emphasized through larger or bold type. Depending on the ad platform, you may not want to include all of that information in a single ad. Choose the most concise and critical information, and consider creating multiple ad variants that include different messaging to find out what details resonate most with your audience. In addition to reviewing outreach copy, your IRB will also want to approve any images you plan to use in promoting your trial. Facial expressions, settings, and actions in your imagery may implicitly communicate messaging that’s not allowed by the FDA. 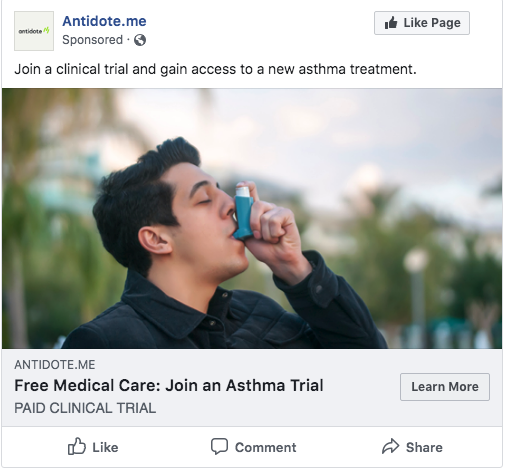 "For example, for an exercise-induced asthma trial, you don’t want to show people running marathons," says Katrina Ambrose, senior designer on the marketing team at Antidote. Images that imply results from the treatment may be considered too promissory by your IRB. If you choose to use imagery with pills or another image of medication, make sure the trial is using the same kind of intervention to avoid confusion. While images shouldn't imply benefits from the trial, try choosing ones that convey life with the disease, or that capture a positive experience interacting with medical professionals. "Safe ways to go are depicting empathy or empowerment, which can be just as effective and are less likely to get your ad rejected," says Ambrose. Beyond adhering to FDA guidelines, it's also important to create advertising materials that connect with patients. When designing outreach materials, consider these tips to help ensure your ads are patient friendly while still following the rules. Talk about the condition the same way patients do. Use patient blogs, disease nonprofits, social media, and message boards to understand the language patients use to discuss their condition. This research can help you avoid using jargon to discuss your trial, and ensure patients will understand your ads. Be mindful of reading level. As you create your outreach materials, keep in mind that the average American reads at an 8th grade level, and most likely does not have a medical background. Websites like Hemingway App can help you measure the readability of your content and reading level, and gives you tips on adjustments you can make to improve the accessibility of your content. Share information that matters to patients. In a survey from CISCRP, patients reported caring most about knowing the physical location of the trial, the goals of the trial, and the risks and benefits of participation. Include the most critical, and engaging, information you can in your ads. Looking for help with clinical trial patient recruitment advertising and design? Download our case studies to learn how Antidote connects patients with research.